When a relic dating back to the times of Old Golarion docks in a remote space station, the Azlanti Star Empire takes notice and quickly seizes it. 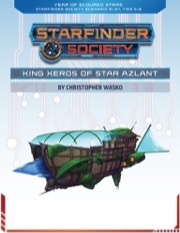 The Starfinder Society dispatches the PCs to stop the Azlanti and reclaim the relic: the ether ship known as the King Xeros. With little time to hamper the Azlanti's upgrades on the strange magical vessel, the PCs must overcome the now functional starship. Only by claiming the King Xeros can the Starfinder Society learn more about its predecessor organization's past. King Xeros of Star Azlant is a spiritual successor to the Pathfinder Society Roleplaying Guild scenario, Pathfinder Society #20: King Xeros of Old Azlant. It also works as further content for players who've played, or are in the process of playing through the Against the Aeon Throne Adventure Path. I played this recently and I was quite disappointed with some of the mechanics. The choice between the Construction Bay and the Greenhouse have drastically different chronicle sheet rewards. The Brakim Admittance boon is a top-tier reward, but Iztheptar Research is completely useless for anyone who has a permanent Personal Boon (such as an existing race boon). On top of that, the boon itself is kinda circumstantial. You get a bonus to Fortitude saves on a disease or hazard if you've already made a save against it? How often (outside akatas) do you actually roll twice against the same Fortitude hazard? How often do you know that such a hazard will exist while slotting your boons? If there were some indication that the Construction Bay was the "correct" choice (i.e. it was more heavily defended, obviously a harder target), then I could understand. If VC Naiaj said that you better be ready for serious fighting if you go there, then okay. But she attributed equal interest in both targets, and the Greenhouse seemed like the curious "what's up with that, what do the Space Nazis want with a bunch of plants?" choice. Of course, none of that would have been necessary if the reward for the Greenhouse was an Admittance Boon instead of a questionably useful Personal Boon. There are five other races in Escape From the Prison Moon that would be acceptable; Neskintis, with their bonus to Life Science and Survival, seem like the obvious choice for a greenhouse. Moving on, the fight against the Azlanti captain is a bit anti-climactic as well. Placing a BBEG caster in a close-quarters fight is never going to end well for the enemy. That room barely has room for the PCs, much less a dynamic battle with spells going off. The "loot hunt" at the end also needs a 4 player adjustment, because it's needlessly punishing against small groups, who may have only one person that can roll for the length of time available to loot the ship, or any of the individual checks. My group had three soldiers and a technomancer, so our skill options were somewhat limited. Having each check take 10 minutes also feels needlessly game-y, since there are existing rules for how long most checks take (a Search check is 1 minute per 20' x 20' square, if I recall). Having each check be 10 minutes, when you have less than 10 minutes before the ship blows up (or whatever) just takes players out of the game and feel railroaded (my experience when players are "on the clock," as it were, is that they don't mess around with searching until they clear the hazard without being beat over the head with phony time limitations). Some aspects of this scenario were good (the space combat was surprisingly fun; I usually dislike space combat), but overall I felt let down by the experience. Overall, I really enjoyed this scenario. It’s got awesome art of King Xeros, great interconnectedness with its prequel, and the Against the Aeon Throne Adventure Path, but is a solid and fun adventure that’s more than capable of standing on its own. It has a different feel and tone to it than most scenarios. It’s dynamic, engaging, suspenseful, and a little frantic. Players and characters should be on the edge of their seats for this one. Player’s get to make decisions that have an effect on the scenario and its outcome. Time matters, so they're not going to get to explore every nook and cranny and will need to make decisions on what is most important to them. There’s some wonderful new ship mechanics that players will get to see the enemy make use of. It’s possible, if your group is too slow, or fails in some of their tasks, that one of the other Starfinder ships will be destroyed during the course of this scenario. Although the repurcussions of this aren’t addressed in the scenario itself, I feel like they should be. This should be a harrowing event, and even if you’re too busy to notice it during the mission itself, learning that a ship full of your fellow Starfinder died to protect you — or possibly because of your failure — should be sobering to say the least. This is definitely something GMs should remember to take into account when running this game. Make it matter. I think this scenario is a great change of pace that will be fun to run at a table. This scenario displays a half-page map of three shipdecks drawn using a ten foot scale. I don't see any reason why it couldn't have been a full page map drawn using a five foot scale. GMs hate ten foot squares. It's particularly difficult for online GMs to prep. I'm not against having oversized, large maps. I recognize the desire for sniper-style combats at long range. Thirty foot squares I can understand. But this particular ten foot scale really wasn't needed. I give my rating –1 Star just for that. But I agree with others that the final fight is wanting. It's also extremely crowded. When I GMed, we had a large-sized PC with reach. There was nowhere the enemy casters could stand to cast safely, and their CR 3 "guards" were a joke. Strong beginning. Entertaining but high-DC Starship Combat. Lackluster ending. I felt there where too much fight. I like it anyway because of the atmosphere. The ride. It made me realise the power of the witchwarper. Three fights and a starship combat is too long. The robot fight was a tad too much. We were never in danger. It make us wonder... does the azlantis are really dangerous? I really enjoyed this scenario. It's got a good premise, the Starfinder (and Azlanti) NPCs do fairly intelligent things. The space combat is interesting, I saw some things that I hadn't seen before. I'm just glad we brought the Drake because we needed the firepower. VampByDay (previous review) doesn't like with how short the mission on board of the ship was; I don't really agree, but I like it because I played King Xeros of Old Azlant before and this setup is a strong callback to that. The combats did feel a bit on the easy side, especially the 4-player adjustment to the final fight was a bit too generous. Also, you have to make a choice between two different routes to take, but you have so information about your options that it's just a guess. But the choice does determine which of (both pretty nice) things you get on the chronicle sheet. So those things stop me from giving five stars. Otherwise, I think it's a solid scenario. I'm unreasonably excited for this scenario. I never post but I am crazy excited for this!! Anybody getting some Event Horizon vibes? I ran a highly modified version of PFS Scenario #20 as a side-quest in my old "Rise of the Runelords" game... the players really liked it! I'm not all that into Starfinder, but I just might have to pick this one up! Sorry about the author confusion on this one. Chris Wasko is going to handle penning this new rendition of Xeros. I've got Boomer on my radar, but it didn't work out for this particular installment of SFS! That being said, Christopher's work on this is looking VERY solid and I think PCs are really going to enjoy what's coming in this scenario. Could I perchance get a further hint, in spoiler form, on what part of Aeon Throne this correlates with? I plan to GM the AP around the time this comes out and I'd love to work it for my PCs to experience it in a good order. While I have no way of knowing for sure at this point, it would shock me a lot if the space station in question in this scenario was not Outpost Zed. This adventure is written to interact with PCs who've played the AP or have not played the AP. There might be some finagling required for players in the middle of the AP, but that'll be minor. Will the ship have the same map/layout? That would be great, because I'm in the process of making a 3D model to run the PFS scenario. It would be awesome if I got some extra use out of it! There's some internal adjustments, but room dimensions remain the same. The image you posted has it made out of wood instead of translucent crystal, with the gigantic black crystal (the phase spike?) looking very different and pointed forward instead of vertically up and down. Is that just the art, or are those changes also in the scenario? You monsters! ;) It's all good. My King Xeros will probably remain translucent crystal, though. No december scenarios announced yet? I think you've already answered this. Sorry, totally forgot about that, because they neither appear at the top of this page (where you can normaly click on the next installment), nor in the "Release Schedule" overview. I don't get why it takes so long to link them there. I have the feeling that Paizo is very slow with news at the moment. Dang, now I gotta at least get a 5th lvl sfs character. Okay, so--just got my copy, and... the ship as described (and as mapped) totally makes sense! Breathing a sigh of relief over here. I haven't even read the rest of the scenario, but what you guys did with the ship makes perfect sense. Woot! Much appreciation over here for your work. Now to start running some Starfinder... and maybe build some modifications for the King Xeros. So there's an issue with the stat blocks that persists whenever a particular monster from Alien Archive gets included. The Aeon Guard's ACs are too high. For a CR 3 combatant, they should be EAC 14, KAC 16, not EAC 19 and KAC 21. It went from sleek crystal mystery ship to some kind of Ethereal plane Noahs ark.